I'm using Global Menu Extension 0.6. 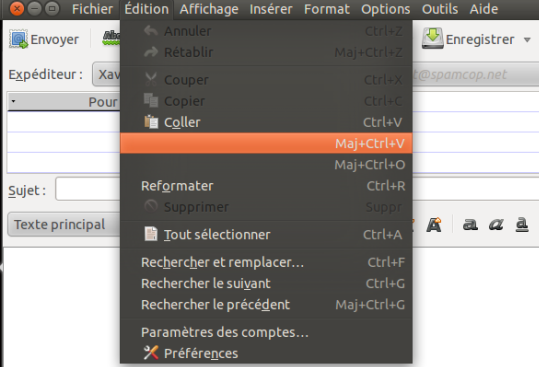 1) Open Thunderbird, with Global Menu Extension installed and enabled. The global menu bar should have File, Edit, View, Insert, Format, Options, Tools, Help (with Insert and Format disabled). Instead, I just see File, Edit, View, Options, Tools, Help, and a big gap where Insert and Format should be. I can't reproduce the original issue now. Mike - do you still get that? I can reproduce the missing entries in the Edit menu though. These labels seem to only be set when the frame is drawn for the menu (which never happens with globalmenu-extension). You can test this by running with GLOBAL_MENU_DEBUG=1 and opening Thunderbirds own Edit menu first. The label isn't stored on the menuitem itself, but it's part of a command element referenced by the menuitem.